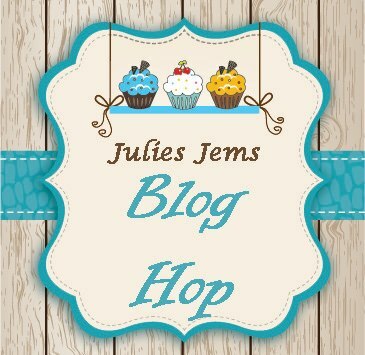 Today is Blog Hop day! Me and 15 other demonstrators in Julie Kettlewell's team (Julie's Jems) are taking part. We have each created special and unique projects using new Stampin' Up! products and will be sharing them today on our blogs. I really love the More Amore product suite in the new Spring/Summer catalogue so I was inspired to create something with a love theme - especially as it's coming up to Valentine's Day. I decided to make a 'Love' wall hanging. I started with some old coasters and I covered these in the More Amore designer series papers. I cut out the letters with the typeset alphabet dies and my Big Shot and then just went crazy embellishing each coaster with hearts, flowers, butterflies, pearls and and rhinestones! I think you can get away with going a teeny bit over the top for Valentine's!! I made holes in the coasters using my crop-a-dile and I threaded Primrose Petals stitched satin ribbon through the holes to tie the coasters together. The bunting behind the 'L' was made with a stamp from the Hearts a Flutter set and matching framelit die. The hearts are punched from the More Amore papers with the small heart punch. I punched out two flowers with the Blossom Punch and added an Itty Bitty punched flower in the centre with a large pearl on top (you can find these in the annual catalogue!). The butterflies - a stamp from the Sale-a-Bration stamp set Bloomin' Marvellous - were punched out with the brand new Bitty Butterfly punch. I couldn't resist making a couple of spiral flowers too, and some small flowers punched with the Itty Bitty Punches. The red heart is cut from a sheet of the More Amore papers and the newsprint heart is the First Edition designer papers punched out with the Full Heart punch. The colours are Primrose Petals, Pool Party, Real Red and Very Vanilla. 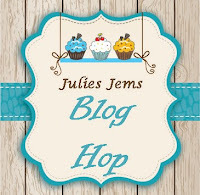 I hope you like my project - please leave a comment before you hop onto to the next blog, which is Sharon's! Fabulous project Kylie - great idea to use the old coasters - a super duper up-cycling with the fabulous papers. PS you have word verification on and it can stop people commenting. Thanks Kate for your lovely comment! I've taken the word verification thing off - didn't realise I had it on so thanks for letting me know! Hi Kylie, I love banners and wall hangings and these really showcase the More Amore Paper beautifuly. This is a great project that would adapt to so many themes and it looks striking. Angie. Thanks Angie - I had planned on making 2 contrasting ones but ran out of time! Thanks Lise! It was really fun to make! stunning project - what a great idea! Oh this is SO gorgeous Kylie.... now where are those coasters of mine!! I can see a CASE coming on!! Thank you again too for being the icon saver!!! WOW this is stunning, what a great idea and love the beautiful colours. This is gorgeous Kylie. Think the More Amore papers are definitely a favorite!